Review & Giveaway: Kalso Earth Shoes! I have a secret. I'm not sure I should tell anyone since I have this reputation of being all Little Miss DIY, not girly girl...Oh, who am I kidding? Nobody believes that anymore. They used to. I used to have guys tell me that I was the least girly girl they knew. Now, I still love DIY but I'm also into nail polish and *gasp* shoes. I know..I know...how cliche, right? 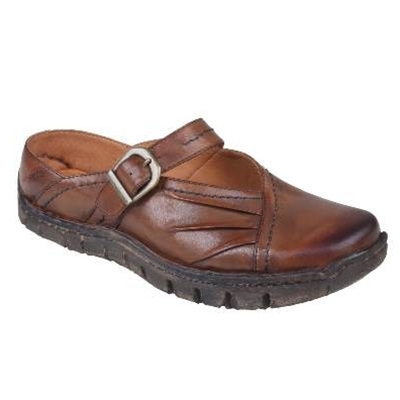 But, have you tried out a pair of Kalso Earth Shoes? I have and man, they are awesome! Truth be told, I practically begged to be allowed to review a pair for them. Luckily, the lovely lady who handles it was probably amused by my eagerness and hooked me up with the pair of shoes you see to your left there. Those are The Link Too and yes, they really are that cute in person too! The first day I wore them out, I received compliments. If you know me, you know I have a very hard time wearing shoes all day long. In fact, when I walk in the door at night, the first thing to happen is I kick my shoes off. Not these! I found myself wearing them all day long and I was home for a good 30 minutes before I realized I hadn't taken them off. They're just plain comfy as well as cute! I confess that for the first bit of time I kept finding myself stepping out of them when I walked. That's all on me though. I'm just not used to wearing this type of shoe. So, what makes these so awesome other than cute and comfy? It's all about "Negative Heel Technology." What is this craziness you speak of? I heard you say it...It means that your heel is actually slightly lower in the shoe than your toes. Think about walking in sand. It's that same effect. Pretty cool, huh? If you look over to your left, there's a pretty snazzy graphic that shoes what this does for your body. I have to tell you that it was wearing a pair of shoes like this back in the spring that totally saved my knee when I sprained it. See? Super cute and I have to say they look good against the Fall leaves. I wish we had more colorful ones in our yard but sadly, we just didn't this year. It's probably because we only have one walnut tree in the front yard. "I just entered to win a pair of @KalsoEarthShoes from @craftsbykatie ! Enter today for your chance to win: http://www.lifewithkatie.com/2011/10/review-giveaway-kalso-earth-shoes.html"
I like the Prance boot. Commented on Kalso Earth Shoe's Facebook Page. I follow Kalso Earth Shoes on Twitter. I follow earth on facebook. I put the gieveaway on facebook. I follow Kalso on twitter. I wrote on fcebook wall telling which shoes are my favorite. I posted giveaway to facebook. I tweeted for the 2nd time today. The Ramini boots are my favorite by far. I like Kalso on FB and commented on their wall that I liked the Invoke shoes.